This site demonstrates remarkable microclimate variation; ask your students to describe the differences they see between the two sides of the valley--they will probably be able to recognize that sunlight creates very different microclimates. Microclimate variation in a felsenmeer, Wisconsin. This felsenmeer (German for a "sea of rock") demonstrates extreme microclimate variation from one side of the narrow valley to the other. The cooler, wetter side is covered with plants and lichens, while the hotter, dryer side is just bare rock. The sides of this east-west oriented valley are covered with broken rock (or talus slopes); the German term felsenmeer refers to a "sea of rocks" (although the slopes of this valley are steeper than a typical felsenmeer). Because the two sides of the valley receive very different amounts of sunlight, they experience very different temperature and moisture regimes. 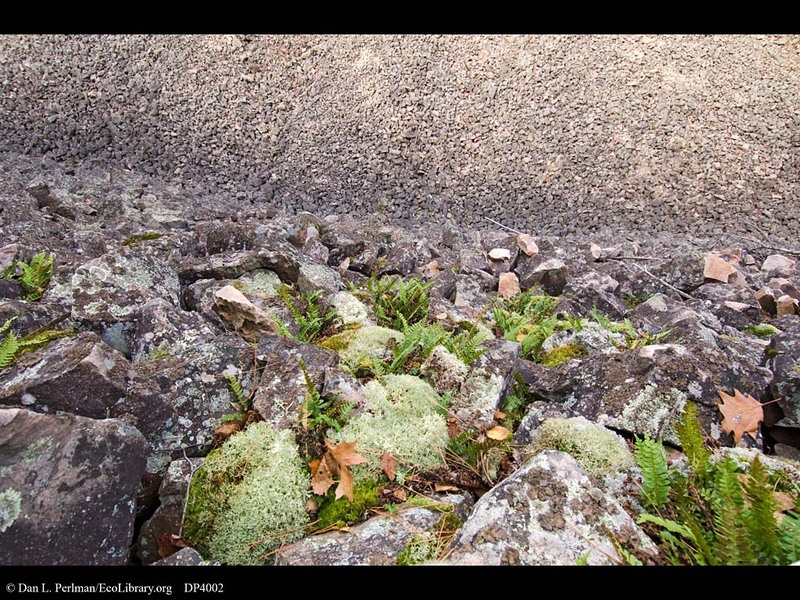 The largely barren south-facing slope is much hotter and dryer than the north-facing slope, which is covered by mosses, ferns, and lichens. The boulders on the shaded side remain especially cool because cold air from deep underground gently wafts up to the surface. It appears that a number of the plant and lichen species on the shady side are typical of regions far to the north of this site. Recent studies indicate that this steep-sided valley was carved by meltwater from a glacial lake created at the time of the Wisconsinan Glaciation about 15-20,000 years ago. Since then, the freeze/thaw cycles experienced by the bare rock lining the valley has created the loose head-sized boulders seen here.